Thought I would say a big thankyou to the team at Avonline Broadband. They are a very helpful bunch. I've had a number of long standing issues with my ADSL home service. I was getting 2.1mb down and .3mb up. I had a number of line related issues where ADSL would drop when the phone rang. I don't have BT Infinity yet. I've been pondering Tooway for 6 months or so and finally went for the top unlimited package last week. 7 day turn around from ordering. The installation took 1.5 hours in total. I instantly had 20mb down and 6mb up and so far so good. I was concerned about the latency issues and this is what held me back for 6 months but I can report that the service I have purchased is actually very usable. My kids are streaming youtube now, we have catchup TV available and i've done 2gb of computer updates just like that. I am a remote worker and can report that a remote VPN to my office does work and I can even run an RDP session to my office PC. There is a lag but its no worse than what I had over ADSL. A VERY happy bunny indeed and I can definately recommend this option to people that have slow ADSL. Hello my friend. I read your post and is a copy of my feels. I moved about 200 meters away my old flat to a new flat, very very nice, and ask for moving my ADSL on april 24. After one month waiting I get the news about no phone-wire in THIS street, and I need to find about 25 customers in this street ot ask for the telephone service and the company will install the wires . I can only reiterate what the OP said. I have had Avonline for 3 weeks now. Very happy with both the service and installation. If Im being picky I would say that I could have done a better job of installing the bracket on the wall. the bracket is not level and some of the holes they drilled are not deep enough for the rawl plugs to go in deep so the brackets whilst tight are not totally flush on the wall. It all looks solid though and it it does blow down I guess Avonline will have to come back out and fix it. Nothing appeared to be happening so I rebooted the modem and it came back up OK. Dont know what that was all about. I had the same problem today. My modem went offline, and my Antenna is very good, but I try to moved it, but I think that it didn�t move and I was loosing my time.... After, I get again the signal in the same position. Sooo... Im not quiet as happy as I was the other day. I spoke to Avonline Broadband regarding my outage last night. There was no system wide issues so it was local to me. The chap on the phone was helpful and suggested I tweak the dish a bit to try and get the RX SNR close to or over 12db. This afternoon I got the ladders out and went up to inspect the dish to see what was what... I paid for it all to be installed by Avonline and I can safely say I should have done it myself. Two of the mounts are not fixed to my wall correctly. Each mount has two bolts and one of the bolts on each side is turning freely in the hole meaning that the supporting brackets are not really that tight. 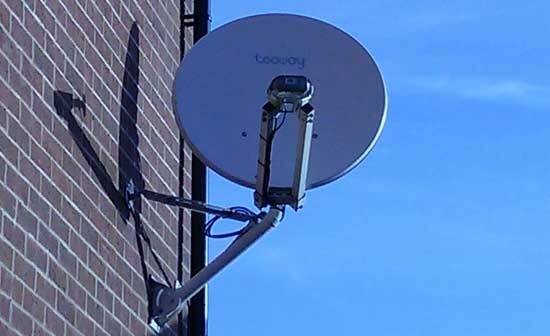 I reckon a strong wind will move the dish without too much trouble. I then moved on to the dish mounts to find that some of the bolts were loose as well... BASIC STUFF!!! I realigned the dish using an iPad up the ladder to control the modem and watch the RX SNR figures and was able to get them over 12db without spending much time at all. Finally I've locked down all the nuts so the dish is as secure as its gonna be until the two mounts are looked at. I have contacted Avonline and have sent over some pictures of the mounts and am waiting for feedback. Now that the dish is aligned better the speed and responsiveness is much better. When downloading Im seeing a constant flow of data now. The moral of the story is to check the installation yourself. Yes my friend. We can do it. I installed the antenna by myself, nd I will fix it again n times forever if I need. Now, I don't want to adjust it anymore, its close to 12 dB and -27 up. Is good for me. PD: You antenna is very nice installed and you have a double tube against the wall. It is good.